The PowerPoint 2013 interface is similar, yet somewhat different than the interface of PowerPoint 2010. The biggest change is that 2013’s interface is primed for use on tablets, touch-screens and smart phones (other than conventional desktops). Thus, you can swipe and tap your way through a presentation — and also make several edits without the need of a cursor. 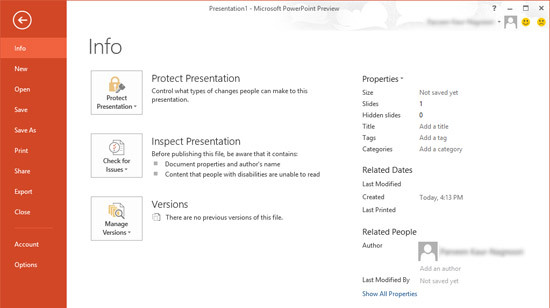 Instead of opening with a blank presentation, PowerPoint 2013 opens a Presentation gallery as shown in Figure 1. The Presentation gallery provides several ways to start your next presentation using a template, a Theme, a recent presentation, a not-so-recent presentation, or even a blank presentation. Once you make choices in this Presentation gallery, you see the actual PowerPoint interface. 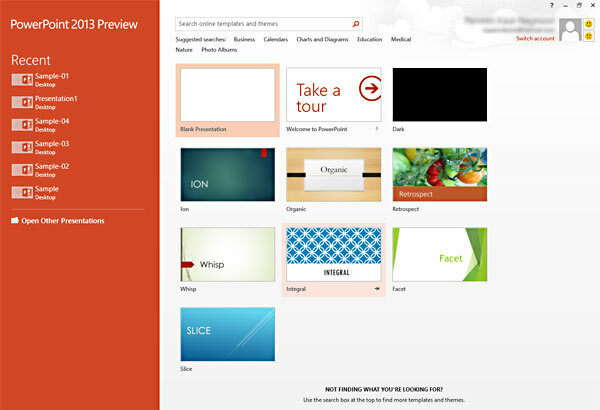 A quick walkthrough of PowerPoint 2013 reveals some new features. Figure 2 shows a screenshot of the PowerPoint 2013 interface — each part of the interface is explained later in this article. File Menu and Backstage View: When you click the File menu, you see the Backstage view that contains all the creation, save, share, and print options for your presentations, as shown in Figure 3. Learn More about File Menu and Backstage View in PowerPoint 2013. Quick Access Toolbar (QAT): Is a customizable toolbar placed by default above the Ribbon — here you can add icons for your often used commands. Also the QAT can also be placed below the Ribbon. 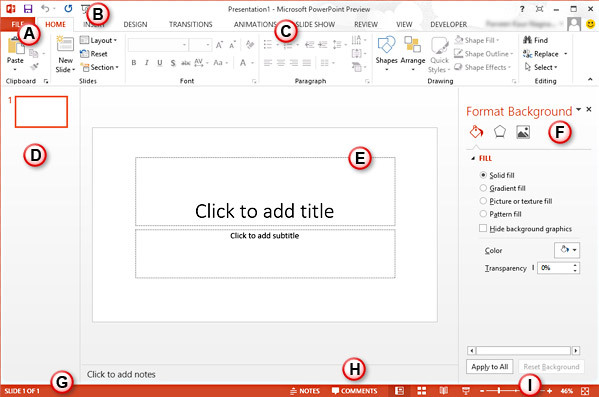 Learn more about Quick Access Toolbar in PowerPoint 2013. Ribbon: Ribbon has tabs which in turn contain groups of buttons for various options — some groups also contain galleries (for example galleries for Themes and Theme Colors). Learn more about Ribbon and Tabs in PowerPoint 2013. Slides Pane: Located on the left side of the interface, the Slides pane shows thumbnails of all the slides in the open presentation. Note: If the Slides pane is not visible, click the Normal button in the View tab of the Ribbon. Slide Area: Displays the active slide. Task Pane: The Task Pane contains more options and appears when you choose an option in one of the Ribbon tabs — for example if you click the Format Background button within the Design tab of the Ribbon, the Format Background task pane opens (refer to Figure 1). Status Bar: A horizontal strip that provides information about the opened presentation like slide number, applied Theme, etc. It also includes the view and zoom options. The View buttons are explained below (see point I). Notes Pane: Right below the active slide, this is where the speaker notes are written for the current slide. Note that none of this content is visible on the actual slide while presenting — although it is visible in both Notes Page view and Presenter view. Normal: If you are in some other view such as Slide Sorter view – click the Normal button on the Status bar to switch to Normal view, Shift-clicking this gets you to Slide Master view. Slide Sorter: Click this button to switch from any other view to Slide Sorter view. The Slide Sorter view displays zoom-able thumbnails of every slide in the open presentation. Shift-clicking this button gets you to Handout Master view. Reading View: Click this button to switch from any other view to Reading view. Slide Show: Show the presentation as a full screen slideshow from the current selected slide. Shift-clicking brings up the Set Up Show dialog box. Mini Toolbar: This toolbar is not shown in the Figure 3, above. It’s a semitransparent floating toolbar that spawns right next to the cursor — and it is also available instantly with a right-click (highlighted in red within Figure 4). Geetesh Bajaj has been designing and training with PowerPoint for 15 years and is a Microsoft PowerPoint MVP (Most Valuable Professional.) He heads Indezine (www.indezine.com) a presentation design studio and content development organization based in Hyderabad, India. The site attracts more than a million page views each month and has thousands of free PowerPoint templates and other goodies for visitors to download.